Calligraphy is the first hobby to excite me, since learning spoken word poetry ten years ago. To learn an entirely new skill has been challenging, but it’s probably the best decision I made to begin the new year. I needed to change my daily routine. It’s been four months since I’ve written a long blog post. After releasing my very vulnerable and gloomy thoughts about my PCOS, I remained in a negative mindset. I felt like I over-shared and exposed too much of my fears, despite receiving warm and friendly support and feedback. For the past year, I have always spread positivity and optimism in every post, so for me to discuss on a much deeper and sensitive topic with a negative tone, made it harder to write positive material. In addition, I had a very busy end of 2018—I performed a spoken word piece at HUBWeek, joined an event committee at my Alma mater, attended many literary and work-related events, and been working tirelessly at my job. I rarely had time to even process the emotions I had after writing the piece. I know, it’s not healthy at all. It wasn’t until the end of December that I came to grips with the overwhelming stress I built up, and it was so bad that I didn’t even enjoy family and friends’ holiday time. Then, calligraphy came along. On New Year’s Eve, while I was on my way to see Barry Jenkins’ If Beale Street Could Talk for the 2nd time, I stumbled across an ad on Facebook for an “Intro to the Basics of Calligraphy” one-day class in Boston. After doing some research on the instructor, price, and accessibility, I signed up for it immediately. Calligraphy (greek meaning = beautiful writing) is an art form of hand lettering and/or handwriting. 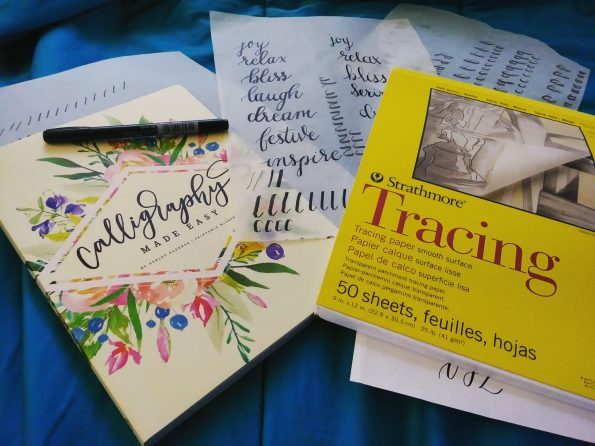 You typically use a calligraphy-made writing utensil, brush pen, or marker. The technique is primarily focused on upward thin strokes and downward thick strokes. About a year ago, I didn’t know the term for the lettering form, but when my brother and sister-in-law got married, I wrote and performed a spoken word piece for them. I wanted to frame the poem after the wedding and write it in beautiful cursive text. The notebooks and canvas paintings that I see all the time in TJMaxx and HomeGoods always has beautiful cursive text, and for a while, I wanted to know how to write like that. It wasn’t until a few months later that I told my supervisor about my fascination for the handwriting, and she told me it was called calligraphy. It blew my mind once I found out how popular the writing style is. I watched countless YouTube sped-up videos with people using markers and pens, but it was not helpful at all for teaching. The one-day class I took in January helped tremendously. Everyone was given a tracing pad, a calligraphy Tombow pen, graphed paper, and the instructor’s alphabet sheet to trace over. For starters, I learned that calligraphy and writing cursive are two different things. The way we were taught cursive is to write very fast in one stroke. With calligraphy, you need to write slow and have multiple strokes by lifting the pen after every letter. That’s when I realized that it’s more of a drawing technique than a writing one. So, you can be great at calligraphy even if you’re bad at cursive-writing. The class was focused on basics, so we were practicing slanted and straight lines, ovals, and u-shapes. With those drills, I had to train my hand to hold the pen at a 45-degree angle and apply pressure to the pen for every downward stroke. Since I took the class on January 9th, I’ve been practicing nearly every day. 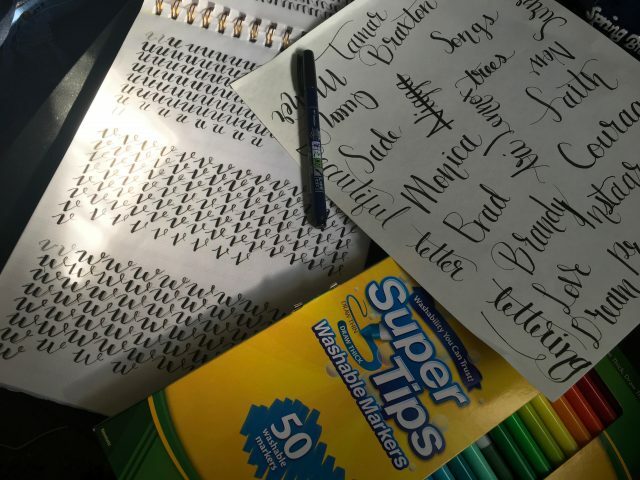 For most people, calligraphy takes months or even years to master, and I’m committed to the process 100%. Learning this new skill provided me with so many benefits for my mental health. I smile more, I don’t stress too much at work, I have more patience, and I’m sleeping better. Sleep has been a huge change because, since college, I don’t remember a single night when I fell asleep before 10 pm. It’s still challenging, but I’m grateful for the nights when I do get 7-8 hours of sleep. Lastly, it has put me in a more positive mindset and gave me the courage to start writing on the blog again. Grateful. I’m now approaching a month of practicing calligraphy, and I’m excited to share more of the progress over the next few months and see my health progress in a beautiful way. Overcoming Fear: What Are Your Ingredients for Happiness?